The Pygmy Wrangler Mouse is a breed of mouse found in the Jungle of Dread. They are known to drop Simple Orbs and Vanilla Beans as loot. It's not often you get to cross paths with an honest-to-goodness Pygmy Wrangler! This rough-and-tough gal left behind a life of archeology looking for danger and excitement. 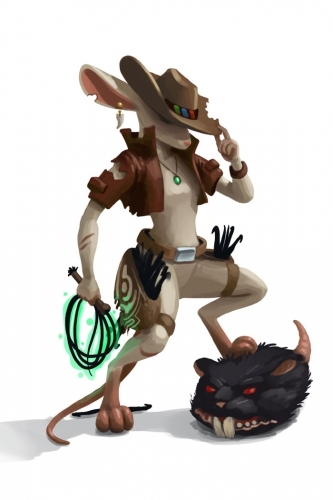 When not raiding for lost treasures in the deepest and most dangerous regions of the Jungle of Dread, she can be found wrangling up Pygmy mice and keeping them in line. Her thirst for wild adventure and exotic treasures has given her a taste for SUPER|brie+, but she will still occasionally settle for a simpler cheese. While Pygmy Wrangler mice can be attracted by standard cheese, they have a distinct preference for SUPER|brie+. The Pygmy Wrangler Mouse was painted live on 2 September 2011 during an 'All about the art' Feedback Friday. Ideas and suggestions for how the mouse should look were provided by the audience at the time of painting. The Pygmy Wrangler was released on 16 February 2012. This page was last edited on 28 April 2015, at 22:10.